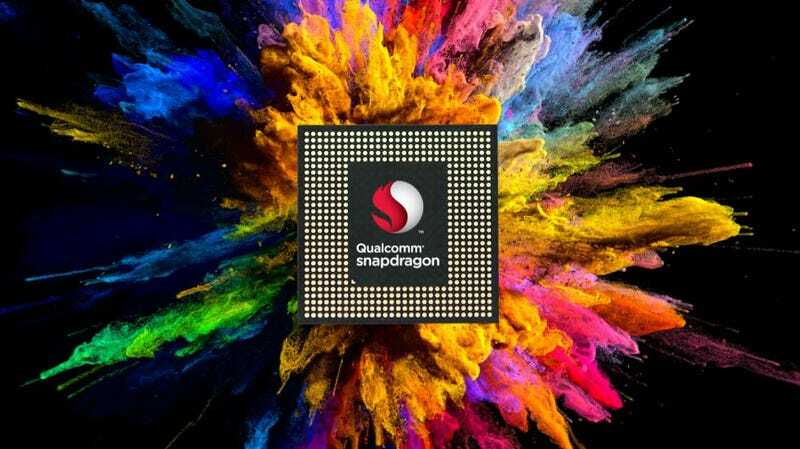 A couple days ago at Qualcomm’s Snapdragon Summit in Hawaii, the company finally unveiled its next flagship smartphone processor: the Snapdragon 845. But until recently, all we had was a name to talk about. Now that details are trickling out about Qualcomm’s new silicon chip—the one that’s going to power all of 2018's big Android phones—here’s a quick rundown of the Snapdragon 845's most important improvements. Even though we commonly use the term processor when referring to chips like the Snapdragon 845, it’s kind of a misnomer. That because these chips are actually comprised of multiple processors that combine to form what is more accurately known as a system on a chip (or SoC). In previous generations, we’ve seen Qualcomm include dedicated processors such as an ISP (image signal processors) or DSP (digital signal processor) for handling photos and videos. However, the Snapdragon 845 is Qualcomm’s first SoC to have an SPU (secure processing unit), which is a new subsystem designed to protect data about your fingerprints, iris, mobile payments, SIM, and more. Soon, anytime you do something like take a picture or download a document, an SPU will generate a unique key that is required to decrypt the data in the file. The SPU can even be used to generate keys for text messages in apps like Facebook Messenger or Whatsapp. And unlike other co-processors on the Snapdragon 845, the SPU is isolated from other systems to help prevent hacking. While high-dynamic range videos are becoming more popular, actually shooting in HDR is something that’s better left to pros. However, that could change soon as the Snapdragon 845's image signal processor will be able to capture 4K HDR video at up to 60 fps. That should result in clips with better contrast, more vibrant colors, and better details. Slow-motion video will also get a boost, now that the SD 845 can record 480 fps at 720p, or 240 fps at 1080P. If you tuned in to the Pixel 2 announcement back in the fall, you’d have seen Google CEO Sundar Pichai spend 15 minutes talking about the importance of machine learning in mobiles devices. So with the Snapdragon 845, Qualcomm is looking to enhance AI-based visual recognition with the Hexagon 685 digital signal processor. On top of being able to handle traditional image processing duties and serving as a sensor hub for all your fingerprint, iris, and face scanners that might be on your phone, the Hexagon 685 should more efficiently analyze and identify objects seen by your phone’s camera. Pure performance improvements aren’t always the most exciting thing to talk about, but it’s nice to know that Qualcomm is promising its new chip will be 25 to 30 percent faster than the current Snapdragon 835. Much of the heavy lifting comes from the eight new Kryo 385 CPU cores, which features four A75 cores that run at up to 2.8 GHz (up from 2.4 GHz on the SD 835) and four A55 efficiency cores to take care of less intense tasks and increase battery life. When it comes to graphics, Qualcomm says the new Adreno 630 GPU is both 30 percent faster and 30 percent more power efficient than the Snapdragon 835's Adreno 540. The main benefit of this extra performance will be seen when using the Adreno 630 to power mobile VR experiences like a Gear VR or Google Daydream. And when combined with Qualcomm’s new Multiview rendering, the Snapdragon 845 should be able to hit 120 fps at 2K x 2K resolutions. One of the big buzzwords around smartphones is the upcoming transition to 5G networks, which promises gigabit bandwidths so you can watch all the Netflix you want in high quality, no matter where you are. So on the Snapdragon 845, you’ll get Qualcomm’s latest X20 LTE modem which supports speeds up to 1.2 Gbps, along with 802.11 AD Wi-Fi and even Bluetooth 5.0 tuned specifically to make wireless earbuds work better. Of course, since the Snapdragon 845 probably won’t make it into actual devices until next spring at the earliest, we’re still a long ways out from seeing if Qualcomm’s next big chip can live up to its promises. Right now, the Xiaomi Mi 7 is the only phone officially slated to feature the Snapdragon 845, but if the future is anything like the past, the SD 845 will also be in Samsung’s, LG’s, and Google’s phones in 2018.